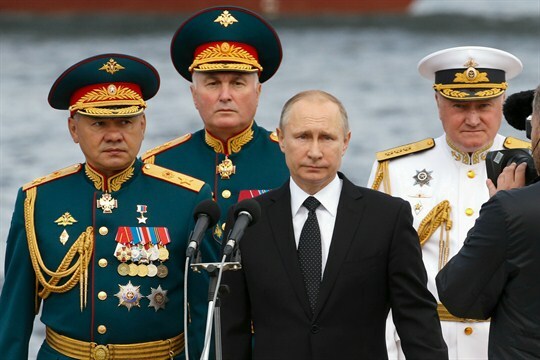 Russian President Vladimir Putin, flanked by top officials, attends a military parade during Russia’s Navy Day celebration, St. Petersburg, Russia, July 30, 2017 (AP photo by Alexander Zemlianichenko). Near the end of a recent report on the resurgence of both the Islamic State and al-Qaida in Libya was an almost offhand mention of Russian special operations forces active along the country’s border with Egypt, helping provide weapons to Gen. Khalifa Haftar, whose forces dominate eastern Libya. This seemingly minor fact is, in reality, emblematic of important trends in Russia’s revanchist foreign policy.